In addition to the usual Friday Night Fireworks that will kick off the Dodgers’ next homestand, Dodger Stadium will host a special 4th of July Fireworks show Saturday. So as if you needed another reason to attend, with Clayton Kershaw and Zack Greinke taking the mound for those two games, there you go. 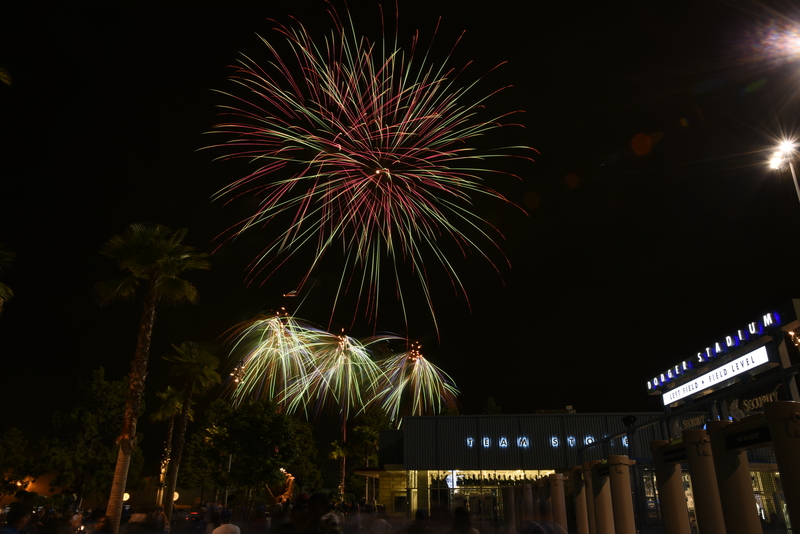 Saturday’s fireworks show will begin at approximately 8:45 p.m. and is presented by Cirque du Solieil (which will bring its upcoming touring show, “KURIOS — Cabinet of Curiosities” to Dodger Stadium on December 10). With the Dodgers’ game against the Mets on Saturday beginning at 4:15 p.m., there will be a musical program featuring the USO Show Troupe between the end of the game and the start of the fireworks. The series with the Mets concludes Sunday with a double dose of pregame activity: Photo Day, when fans can take photos of their favorite Dodgers on the field prior to the game, and Viva Los Dodgers (presented by State Farm and Time Warner Cable), located at the historic 76 station. 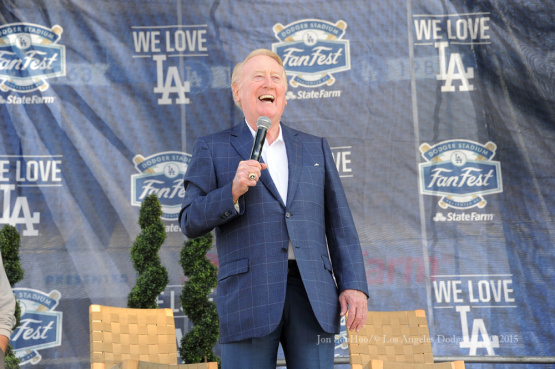 Viva begins at 11 a.m. and will feature photos with Dodger broadcaster Fernando Valenzuela. You know Adrian Gonzalez had a great start to 2015. You know he has had a great career. But do you really appreciate how high Gonzalez is rising among the best first basemen in the history of the game? 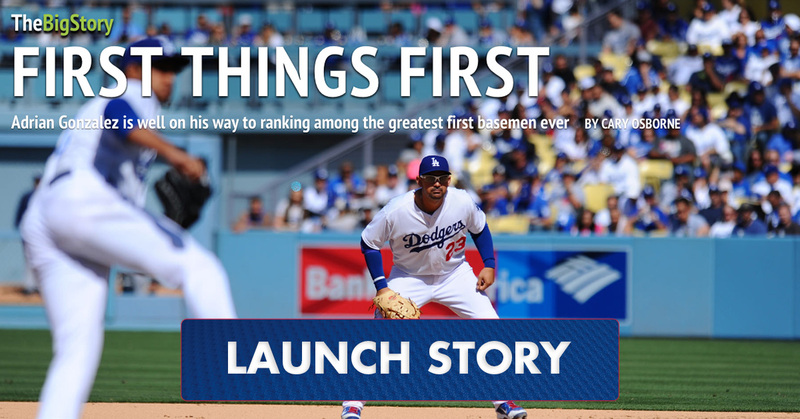 Answering that question was a main goal of Cary Osborne’s Dodger Insider feature, which was our May cover story and is now the latest in our new series of online specials. What we found might surprise you: Gonzalez is already a top-40 first baseman all-time, and aside from Eddie Murray and (for now) Gil Hodges, he is well positioned to finish his career as the greatest first baseman to spend any significant time in a Dodger uniform. But read the entire story to get the details. Our inaugural special, “Inside the #RallyBanana,” can be accessed here, our “Meet the Originals” package on the 50th anniversary of the MLB draft can be found here and our “What Wood You Do” bat feature can be found here. How unlikely was the Dodger bullpen meltdown in Monday’s 10-6 loss to Arizona? Joel Peralta (one inning, two-run homer): Hadn’t allowed two runs in a game for 11 straight appearances. Hadn’t allowed a two-run homer since June 27, 2014. Yimi Garcia (one inning, two-run homer): Hadn’t allowed two earned runs in a game or a two-run homer for 12 straight appearances. Juan Nicasio (one inning, two runs): Allowed two runs in an inning once (June 7) in 24 appearances this season. Adam Liberatore (1/3 innings, two inherited runs): Had stranded 10 of 14 inherited runners this season. Pedro Baez (one inning, four runs): Had allowed three runs all season in 16 appearances. J.P. Howell (1/3 inning, two inherited runs): Since the start of the 2014 season, had stranded 44 of 49 inherited runners, never allowing two to score in a game. But then Paul Goldschmidt came to the plate. That all blew up in the same game, ending the Dodgers’ 26-game winning streak when scoring at least six runs, wasting the fourth-inning home runs by Yasmani Grandal, Andre Ethier and Joc Pederson. And the Dodgers took it hard. Sandwiching a home run in the same inning by Yasmani Grandal, Dodger outfielders Andre Ethier and Joc Pederson each hit fourth-inning blasts that made a bit of history tonight in Arizona. Pederson’s home run, which almost predictably came after a first-inning walk and third-inning strikeout, was his 20th of the season, making him the first Dodger since Gary Sheffield in 2000 and fourth in Los Angeles Dodger history to have at least 20 homers and 50 walks before the All-Star Break. 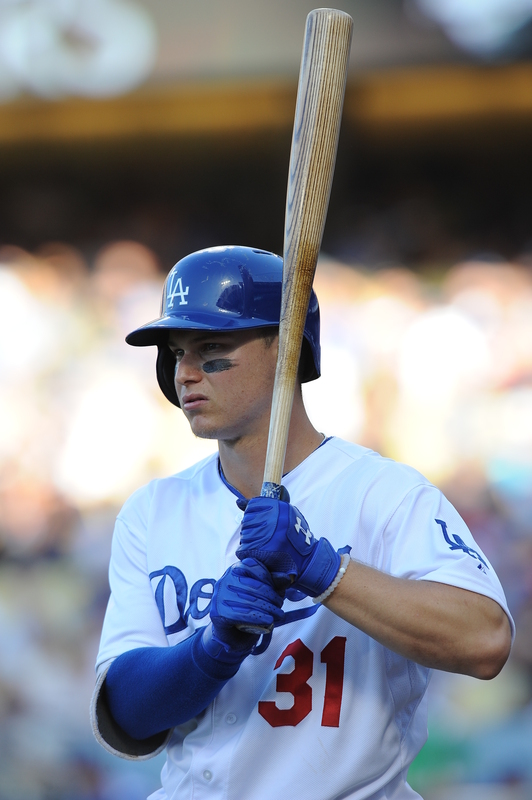 The 23-year-old rookie is only the eighth Dodger rooke ever to have 20 homers in an entire season. Joc Pederson with a 461-foot HR. As my colleague Cary Osborne informed me last week, Pederson is ahead of the pace needed to become the first rookie in MLB history with at least 40 homers and 100 walks. Al Rosen came closest in 1957 with Cleveland, homering 37 times and walking 100. Only two National League rookies have hit more homers before July 1 than Pederson: Wally Berger (22, 1930, Boston Braves) and Albert Pujols (21, 2001, St. Louis Cardinals). But let’s not forget Ethier. His home run was the 155th of his career, which the Dodgers’ public relations department noted put him in sole possession of ninth place on the Los Angeles Dodgers’ all-time list, ahead of Willie Davis. It also gave the Dodgers six players with at least 10 homers before the All-Star Break for the first time since 1979, which admittedly was a team that finished the first half of the season in last place. Grandal, who hit his 11th home run, is one of those six players. Carl Crawford, who has been sidelined since April 27 with a right oblique injury, is scheduled to begin a rehab assignment with three games at Single-A Rancho Cucamonga beginning Tuesday, Don Mattingly told reporters today. Crawford is then expected to move on to extend that assignment at Triple-A Oklahoma City, while the Dodgers return home for their 10-game homestand that precedes the All-Star Break. The 33-year-old has a .260 on-base percentage and .408 slugging percentage in 50 plate appearances before the injury. That .668 on-base percentage nearly matches the .684 OPS he had in the first half of 2014, a figure that declined to .601 through August 9 last year. From August 10 through the end of the 2014 regular season, Crawford turned things around 540 degrees (yeah, that much! 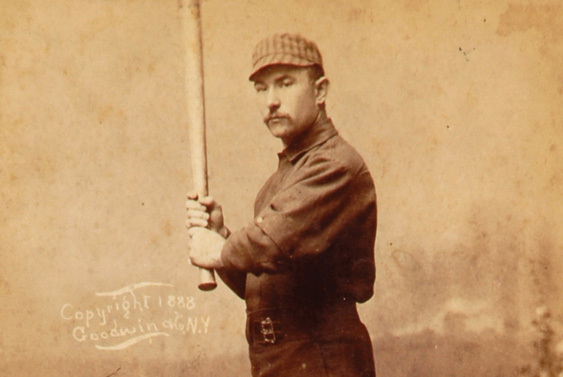 ), with a .463 OBP and .606 slugging in his final 135 plate appearances. In the final All-Star Game balloting update before the results are announced July 5, no Dodger is within more than 2.4 million votes of a starting spot — but there is still some intrigue. Although Bryce Harper returned to play Sunday for Washington after a brief absence, the next three National League vote leaders in the outfield — Giancarlo Stanton, Matt Holliday and Nori Aoki– are on the disabled list. If none of those three are able to play in the game, Dodger center fielder Joc Pederson, in sixth place with a 330,000-vote lead over Jason Heyward, would be in line to start. NL All-Star manager Bruce Bochy of the Giants will make the decision on who starts in place of any injured players, but fan balloting should be a factor in his selection (along with, perhaps, the presence of Dodger manager Don Mattingly as one of his coaches, not to mention the fact that the Dodgers have let the NL West most of this season). In any case: Your votes still matter. You can read more about the selection process here. Vote up to 35 times until the July 2 deadline. Here’s a direct link to the ballot. Earlier today on Fangraphs, Dave Cameron explained why he’d select Pederson to start and add Yasmani Grandal, Adrian Gonzalez, Justin Turner, Zack Greinke, Clayton Kershaw and Kenley Jansen as reserves. The starting position players for the 2015 All-Star Game will be announced Sunday at 4:30 p.m. Pacific on ESPN, with the reserves named the following night (July 6) at 4 p.m. Pacific on ESPN. Pitchers and reserves are determined through a combination of player ballot choices and managerial selections. The All-Star Game Final Vote for the 34th spot on each team’s roster will then begin, continuing through July 10. In the history of the Dodgers, only one time has a pitcher had a better ERA in the first half of a season than Zack Greinke’s 1.58 with the Dodgers today. That pitcher was Don Drysdale, the year of his record streak of 58 consecutive scoreless innings. 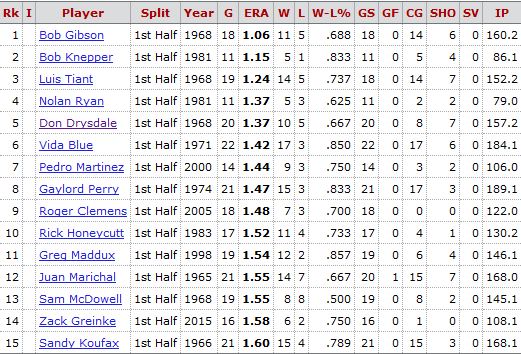 Drysdale had a 1.37 ERA before the All-Star Break, before finishing the year at 2.15. If Greinke, who extended his own scoreless innings streak to 20 2/3 innings in the Dodgers’ 2-0 victory Sunday over Miami, can maintain his current ERA over what figure to be his two remaining starts before the All-Star Break, it would only be the 15th time in the past 50 years that any MLB starting pitcher has had an ERA below 1.60 at the break (minimum 75 innings). If you really want to get ahead of yourself, nine starting pitchers — none of them Dodgers — have finished a season with at least 150 innings and a park/era-adjusted ERA better than Greinke’s today. The best was Pedro Martinez (1.74 ERA, 291 ERA+). Greinke’s current ERA is lower than Martinez’s, but the easier pitching enviroment puts Greinke’s ERA+ at 235. Don’t expect Greinke to keep his 2015 ERA below Robert Hoover’s grade-point average at Faber College, but it’s still fun to think about. The best and worst teams are separated by 1 1/2 games. And the Dodgers are even with the Diamondbacks and Padres even though they’ve essentially outscored those two teams by 37 and 34 runs. Los Angeles is 4-6 in one-run games this month. The June division title will be at stake Monday through Wednesday, when the Dodgers finish their 10-game road trip and stretch of 34 games in 34 days at Arizona. Zack Greinke enters today’s game with 13 consecutive scoreless innings, a 0.98 ERA in his past four starts and a 1.79 ERA with a .596 opponents’ OPS in the nine starts (60 1/3 innings) he has made since his last victory. The Dodgers are 4-5 in that period. 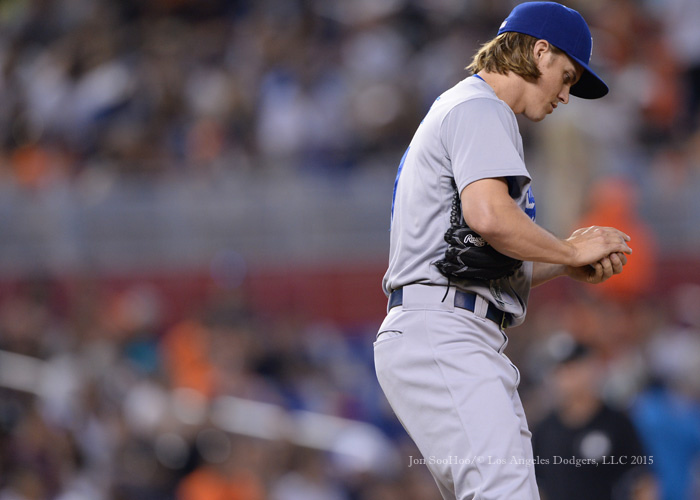 Greinke has pitched 59 full innings since his last win, and has shut out the opponent in 49 of them. With one out in the first inning today at Miami, a few moments after the 11th home run of Justin Turner’s incredible 2015, Marlins left fielder Christian Yelich reached first base on an infield single. The next batter, Adeiny Hechavarria, hit a blooper to right, and you thought, “Here we go again” with Clayton Kershaw. That wasn’t even the half of it. Andre Ethier’s throw to third base squirted past Turner and an admittedly poorly positioned Kershaw, allowing Yelich to score and Hechavarria to get three bases out of his hit. Then came a wild pitch by Kershaw, and just like that, 210 feet of hits had yielded two runs. In the next inning, Kershaw gave up a leadoff double but appeared ready to emerge unscathed three batters later, before Joc Pederson misjudged a drive to center by pitcher Tom Koehler. Pederson volleyball-set the ball into the air, but it spiked before he could find it, and the Marlins had a third run. The kicker: The Dodgers had a franchise-record 13-game errorless streak entering the game. 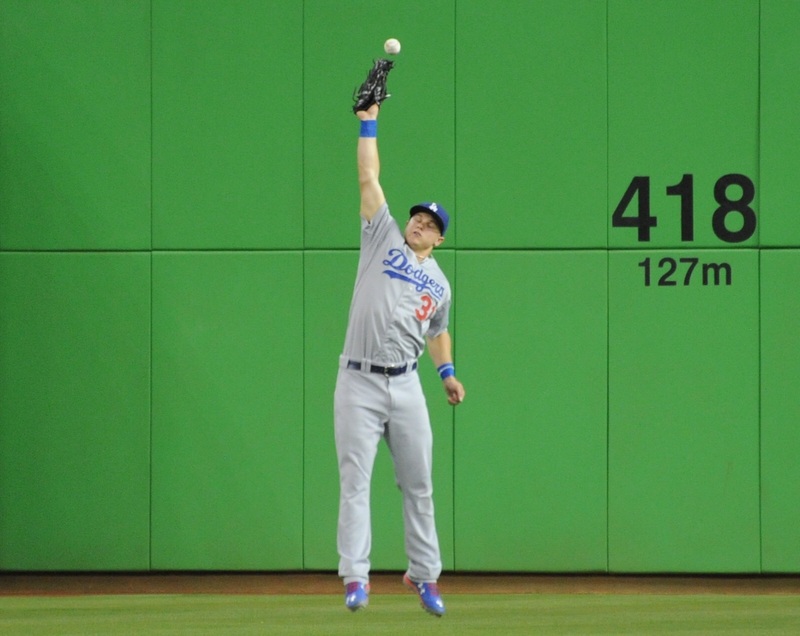 And Kershaw, who had been bitten by home runs recently, didn’t come close to allowing one out of the park. And all it meant was the first three-start losing streak of Kershaw’s career, a 3-2 defeat, and the latest chapter of brilliance disguised. Kershaw allowed five singles and two doubles, while walking none and striking out nine. No, Kershaw hasn’t been perfect. On the other hand, here’s his record over his past seven starts: 48 2/3 innings, 30 hits, nine walks, 67 strikeouts, 1.85 ERA. Even his maligned homer rate in that stretch is 0.9 per nine innings. After Adrian Gonzalez’s RBI single (on a drive that befuddled Yelich about as much as Koehler’s confused Pederson) put Turner at second base with the tying run in the top of the fourth, Andre Ethier ripped a liner to second base that Dee Gordon snagged, and Hechecarria and Gordon than combined on a stylish double play off the bat of Yasmani Grandal. Over the remaining five innings, the Dodgers got two baserunners, moved each of them to second base with two out, and stranded them there. Kershaw kept the Dodgers close, even striking out the side after Marlins reached first and third with none out in the sixth, but the early fumbles were too much to overcome. Although Paco Rodriguez was seeing some progress in rehab, it was not enough. The 24-year-old left was examined Thursday by Dr. Neal ElAttrache, who recommended an arthroscopy to remove loose bodies in the back of Rodriguez’s elbow. Surgery will be performed July 2, with Rodriguez expected to be sidelined for 8-10 weeks. That figures to put Rodriguez out of action at least until rosters expand in September. 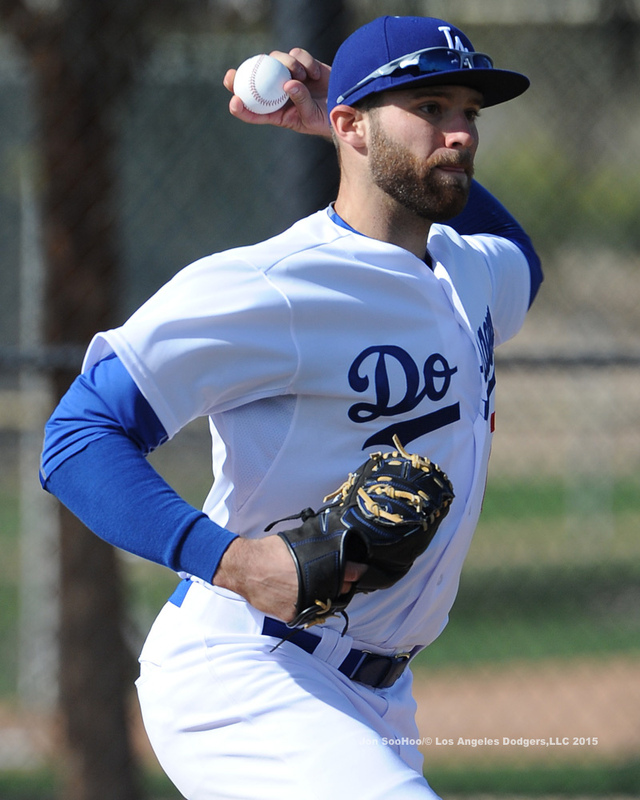 A Dodger second-round draft pick in 2012, Rodriguez became the first from that entire draft to reach the Major Leagues, and from in 61 innings (87 games) 2012-13, he had a 2.21 ERA, 0.92 WHIP and 10.2 strikeouts per nine innings. 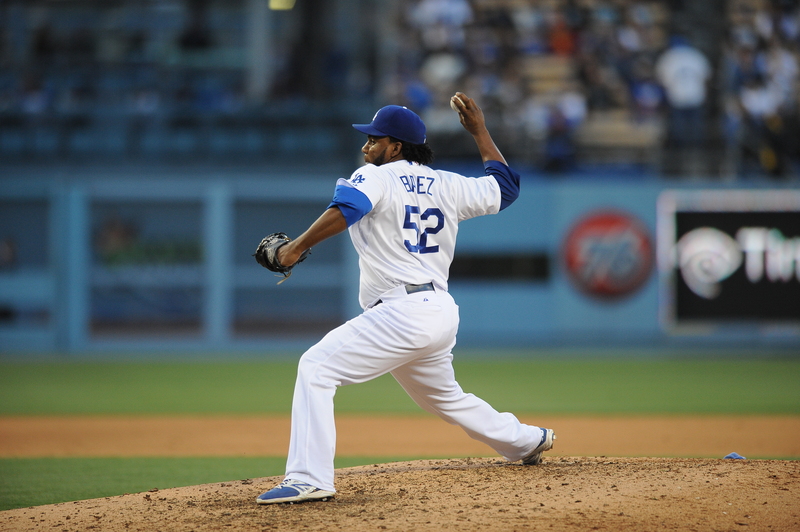 Rodriguez has thrown 24 1/3 big-league innings since, with a 3.33 ERA, 1.19 WHIP and 8.9 K/9. He most recently pitched for the Dodgers on May 29. Dodgers at Marlins, 1:10 p.m. 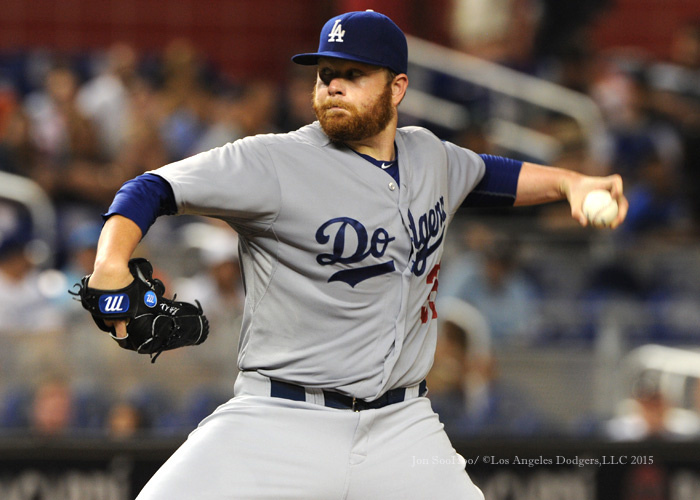 In this Back to the Future season, Brett Anderson has passed 2011 by. Next stop: 2010. With his seven innings in Friday’s 7-1 Dodger victory, the 27-year-old left-hander has reached 89 in 2015, surpassing his 83 1/3 in 2011 for his biggest output in the past five seasons. Anderson is now 23 1/3 innings from matching the second most durable season of his career, 112 1/3 innings in 2010. Moreover, Anderson is rolling. Since May 1, he has averaged 6 1/3 innings per start with a 2.47 ERA, and has allowed more than two runs twice in his past 11 starts. Anderson not only set a Dodger record, according to research by Eric Stephen of True Blue L.A., by picking off two runners in the same inning, he also tied a career high with 10 strikeouts, admittedly against a Marlins team that went completely whifftastic Friday. Miami’s final 10 outs of the game came on strikeouts, interrupted only by an eighth-inning single by J.T. Realmulto, the only one of the Marlins’ 11 batters not to fan. According to the Elias Sports Bureau (via the Dodgers public relations department, it marked the first time in Los Angeles Dodger history that the club had finished a game by recording the final 10 outs via strikeout. Relievers Adam Liberatore and Pedro Baez (the latter in his first appearances since May 13) each struck out the side in their innings, giving Los Angeles pitchers 16 for the game. Baez’s last six outs have been strikeouts, and he now has 13.8 strikeouts per nine innings and an 8.3 strikeout-walk ratio. National League homer leader Giancarlo Stanton struck out three times, a prelude to the unfortunate report that he has a hamate fracture in his left hand that will sideline him for at least a month. With the 16 strikeouts, two pickoffs and eight groundouts induced by Anderson, Dodger outfielders had an exceptionally quiet night. Alex Guerrero didn’t field a ball in play — neither a hit nor an out — and Scott Van Slyke didn’t touch a ball either until Realmulto’s single, which itself was deflected by Jimmy Rollins. Four Dodgers recorded putouts: catcher A.J. Ellis (16), first baseman Adrian Gonzalez (eight), shortstop Rollins (two, both on the pickoffs) and a single catch by Joc Pederson in center field. Van Slyke and Guerrero weren’t non-factors, though. 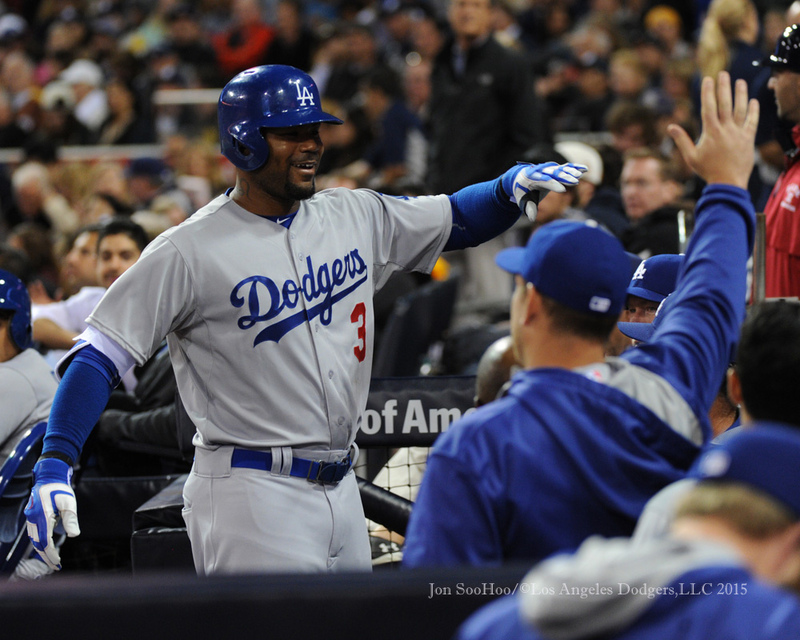 Van Slyke hit a two-run homer in the second inning to give the Dodgers a lead after falling behind, 1-0, in the first inning on the Dee Gordon Manufacturer’s Special (infield single, stolen base, two groundouts). Guerrero added two hits, a run and an RBI. Howie Kendrick had four of the 11 singles by the Dodgers, who put 18 men on base overall and went 5 for 10 with runners in scoring position. Yasiel Puig’s right palm even felt well enough for him to pinch-hit and play the final two innings in right field. In a 1 p.m. Pacific start today, Clayton Kershaw hopes to put his home-run woes behind him and extend the Dodgers’ road winning streak to four games. Kershaw, who has a 1.94 ERA in his past six starts dating to May 26, has 48 strikeouts this month. With 14 today, he would top his June 2014 performance for the most strikeouts by a Dodger in a calendar month since Sandy Koufax. The good news for the Dodgers is that after a six-week absence, righty reliever Pedro Baez has been activated from the disabled list. Before suffering a right pectoral strain (while facing tonight’s Dodger opponent, the Miami Marlins), Baez had allowed 15 baserunners in 15 1/3 innings this season while striking out 22, with a 1.76 ERA and all 13 of his inherited runners stranded. In his most recent 8 1/3 innings, from April 24 to May 13, Baez was unscored upon, allowing four hits and a walk while striking out 12 of the 30 batters he faced. He pitched three shutout innings in his three-game rehab assignment with Triple-A Oklahoma City. Ian Thomas, called up this week without making a pitch, has been sent back to Oklahoma City, whose starter tonight is the rehabbing Brandon Beachy. Beachy is expected to throw about 60 pitches. Another teammate, Brandon League, is scheduled for back-to-back rehab appearances this weekend. Meanwhile, Yasiel Puig is still on the bench to allow a torn callous on the palm of his left hand to heal. A.J. Ellis, who has reached base in 14 of his past 32 plate appearances with a .452 on-base percentage, is starting for the second day in a row. Yasmani Grandal was destined to get a day off in this series, and the Dodgers have decided to give it to him tonight so that Ellis can start against Marlins rookie lefty Justin Nicolino, who pitched seven shutout innings in his MLB debut June 20 against Cincinnati. Probably all anyone will remember about the Dodger bullpen from this series at Chicago was the 10th-inning loss Tuesday. But here are the Dodger reliever totals from the four games: 13 innings, 12 baserunners, nine strikeouts, 1.38 ERA, five inherited runners, four stranded. That includes 8 1/3 shutout innings in the past 20 hours to help the Dodgers come away with a 4-0 victory today and a (drum roll) a split on the road against (cymbal crash) a winning team. In all of 2015, no bullpen in the National League has allowed a lower on-base percentage or slugging percentage than the Dodger bullpen. And no NL bullpen has a higher strikeout rate or strikeout-walk ratio in 2015 than the Dodger bullpen. It is still not a top-of-the-line group when it comes to run prevention: fourth-best in ERA (2.99), eighth in stranding inherited runners (26 percent). The latter is compounded by the fact that only the Giants have bequeathed more runners to their relievers this year. And after throwing more than 50 pitches each of the past three games, the relievers could use a bit of relief themselves. So there is still room for improvement. But as I wrote earlier this month, the Dodger bullpen has come a long way. Though not strictly a rookie move — Mike Bolsinger is technically a veteran — the Dodgers renewed their tradition of sending a newbie or three out into the streets near Wrigley Field to get coffee and coffee-like drinks. SportsNet LA’s “Backstage Dodgers” shared a clip.